Serra Cafema is a new camp located in the extreme north-west of Namibia and is probably the most remote camp in Southern Africa. The Okavango Delta in Botswana is closer to Windhoek (Namibia's capital) than Serra Cafema is to Windhoek! For those who appreciate truly wild places, the journey to Serra Cafema is one of the most exciting in all of Africa - the flight in takes guests over some incredible scenery. The airstrip is well to the south of the camp in the Hartmann Valley, an immense grassland plain between two high mountain ranges. The camp's Portuguese name comes from the mountains to the north that dominate the skyline. The region is shared with wonderful Himba people who are some of the last true nomadic people in Africa. The Kunene River is the only permanent source of water in the whole region and the river creates a lush oasis along it's banks surrounded by rugged mountains and sand dunes. In some ways, being at Serra Cafema is a bit like being on the banks of the Nile as the Kunene River meanders through the desert. Serra Cafema Camp is owned and operated by Wilderness Safaris. This small, private camp is built within an island of ancient, shady Albida trees on the banks of the Kunene River. The camp is rustic and peaceful, with all the comforts in fully furnished tents with en-suite bathroom facilities. The camp is open again from 14 March 2003 after a complete overhaul to rebuild the tents to a higher standard. The camp's six tents are raised off the ground. The camp has a small swimming pool, dining room and bar. The camp is located just inland from the Atlantic Ocean and the Skeleton Coast. The cool winds that blow from the Atlantic help to keep the camp cool, even in summer. Guests will spend time in breath-taking landscape scenes in the Hartmann Valley, to the south of the camp, with herds of Springbok, Ostrich and even Leopard. 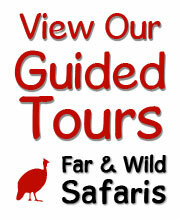 Game drives amongst the sand dunes on 4x4 vehicles and boating on the Kunene River are the focus for the area. Walking trails in the remote mountain and river valleys will always be a highlight for those who enjoy foot safaris. Serra Cafema is often visited by the native Ovahimba families who live in the nearby vicinity which give the guests the chance to learn all about their lifestyles and traditions. A new activity for 2003 is a quad bike route through the sand dunes. Guests will travel out in formation with a guide and head for the dunes. The excursions will be carefully controlled to ensure that there is no environmental damage - and will get guests into some wonderful areas while having a lot of fun. The wildlife consists of similar species to Skeleton Coast's - Springbok, Ostrich, but with the perennial Kunene River nearby, guests will also experience rich bird life and Crocodiles. On the boat trips, one can watch KuneneCrocodiles basking the river banks. By air into Hartmans Valley airstrip.